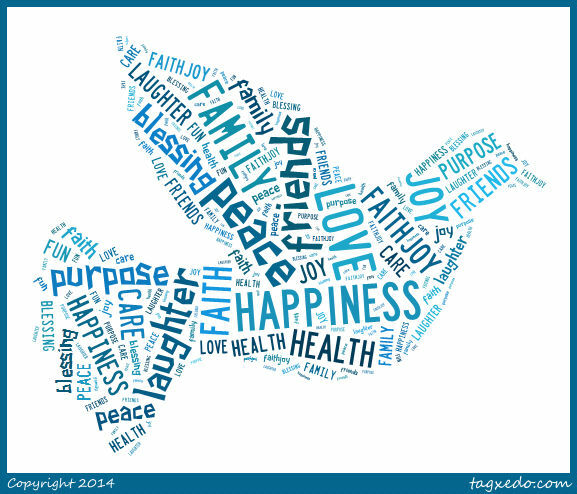 Praying at Christenings – two ideas to involve the family and friends. Christenings – whether they are in the main church services or separately – always involve a time of prayer for the child, and for their parents and godparents. Many people aren’t sure what sort of thing should be included in a prayer, especially if they don’t pray regularly themselves, but one thing that everyone has in common when they come to a christening is that they are part of a gathering in which there is a huge amount of goodwill focused on one person: the child who is being christened. There is often talk of christening being the start of a journey, so people will also be thinking about the future, and the potential of the child in their midst – the kind of person they will grow up to be, the kind of world they will grow up living in, and the life they will lead. Here are two ways to harness this goodwill and these hopes, fears, and dreams, into prayer that can be part of the christening service itself, and have a lasting and wider impact afterwards. When you visit the family, don’t be afraid to talk about prayer – try and make connections between the promise to pray that they will make in the service and the hopes and dreams and thanksgivings and fears that all new (and not-so-new) parents have when they think about their children. Invite the parents to work together to come up with either a fully-worked out prayer, or some key words or phrases that you can help them fashion into a prayer. Also ask the parents to send you a photo of their child. 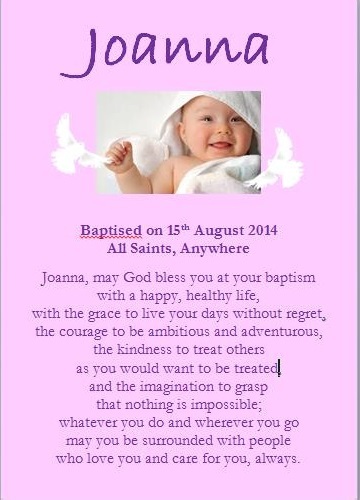 Once the prayer is finalised, use it, together with the photograph, the name of the child, and the date and place of the baptism, make it look attractive, and put it in a frame (about A6 size works well) so that you can present it to them on the day. Many families will keep this as a treasured possession, display it in their home, and even ask for more copies to send to godparents and grandparents. If you save it as a jpeg and email it to the parents they can share it on social media. How about printing out enough copies on paper (without the frame!) for the family and friends who have come to the christening? If you get a chance to meet the godparents in advance of the service, you could invite them to write a prayer too. You can use prayers written by parents or godparents in the christening itself – they may wish to read them out, or they may prefer the vicar to do it! At a christening there may be dozens of others, not just godparents, but wider family, friends and neighbours, who all have one thing in common: they have come to church to celebrate the life of a child, to be part of something, and to wish that child well. This goodwill and presence is an immense gift. How can it be ‘harnessed’ and enfolded prayerfully both in the service and beyond? stick a post-it note onto each order of service, and leave pencils in the pews, and invite people (at some point in the service) to write just one word on their post it note, expressing their prayer or hope for the child being baptised. You can ask them to leave their post-it note on the service sheet, and peel them off after the service, or you could gather them in at some point during the liturgy. If your church is well resourced you might even be able to afford ‘posh’ post-it notes (a nice colour, an interesting and appropriate shape etc). Have a graffiti board as people come in (or as they go out, or both) inviting one-word hopes and prayers. You may get multiple copies of ‘peace’ ‘love’ ‘friends’ ‘happiness’ ‘laughter’ etc, and that’s ok. People don’t have to write something different from everyone else, they should be encouraged to write whatever feels most important. They can write several contributions if they like – but each should be one word long. However you collect the words, it’s what you do with them after the service that makes this into something beautiful. Go to www.tagxedo.com or a similar site and type in the words (include each word as many times as it was contributed – if 25 people all wrote ‘love’ then type it in 25 times! ), then simply click to create a beautiful piece of word-art that is a prayer for the child written collectively by the whole gathering on the day. On most tag-cloud creation sites you can configure colours, shapes, fonts etc. If you save it as a jpeg, you can email it to the family and invite them to share it on social media or email it round to their friends who came on the day. The illustration above is just a sample – when creating this for a real child, you could also type in their name (multiple times) so that it is featured in the finished piece of word art, to make it even more personal. Again, you could keep the jpeg and send it to the family for the anniversary of the baptism, and encourage them to share it on social media. The tag clouds don’t include photos, so an album of them could be kept in church without anyone having to worry about the child protection issues around keeping or displaying photographs of children. Because these ideas involve computers and websites, it may be that you know a teenager who would like to make them for you, as their ministry…. They may have more ideas about how to create something beautiful as a lasting and net-share-able gift for those who come to church for baptism.